The only way you can succeed is if you are able to secure funding to grow your company and the company’s value. By now you may have a great idea, a group of people and a fantastic attitude towards making your business idea a reality. You are all excited to put it all together and start the work. You have even started to prepare all the legal documents for the business like registering the business and incorporating it. But you are short of funding and without this, your company cannot enter the market and start gaining value. The only way you can succeed is if you are able to secure funding to grow your company and the company’s value. Each startup has a different requirement and is entirely based on the needs that you deliver to the market. And in the end funding is the most important thing that can help your company’s value increase. As per a recent study conducted, over 90% of startups fail in the first year of their operation. One of the main reasons of this is the company funding. Some may choose to raise funding for your business, rather than just sitting on bootstrapping. And if you find the right investment options and you have made a deal, what is the next step? How would you know what your company value is or how to use a cap table for keeping the company records? This extensive guide helps you with some of the most important points to understand how to go about the funding options for increasing your company’s value. It is important to understand that your company value can only increase when your company grows. And your company can only grow when it gets the necessary funding to operate well and become successful. So, if you are ready to get the funding and increase your company value, below are some important things to be kept in your mind. The best way to show and increase your company’s value is through your business plan. A well written and organized business plan will define the purpose of your business and the vision of the founders to your potential investors. The initial step to get investments for increasing the company value is to create a business plan that would help you obtain funds from outside investors. When you approach potential investors, they normally look for the business plan and the purpose of the business before they move towards the financial figures. This is the reason why it is important to have the right ones in place. The vision of the product would give a clear direction for the business, discussing the primary benefits you would be offering to customers. This vision should be something that is achievable, simple and high-level. Moreover, the company should be able to achieve this as a whole. This means that the team should be able to accomplish the vision concerning technical support, management, and even sales and marketing. Along with having a product vision, you need to be in control of how things unroll. For this, it is vital to keep a positive working environment, and that the value is delivered to customers. Having the right plan doesn’t always mean you can succeed. Working towards it also matters when it comes to growing and increasing your company value. For any task that ranges from the technicality of the products and support to the marketing and the sales of the products, you would need a great team that would work to create viable products and a well rounded business. Other than this, you would also need a team to deliver the outcome in the exact time-frame as per your plan. With describing the exact type of skills needed, you would be able to keep a much clearer plan regarding your team members as well. With the help of these points, you would be able to display a better idea about what you have in mind for your business. They would help investors understand exactly how you plan to increase the company’s value and how serious you are about it. In the end, this would help you get the funding for your business. Other than having a perfectly built business plan showing a clear purpose, there are other points that need to be considered. Here are five major tips that should be on your business plan and that would help you obtain the investment needed to increase your company’s value. The first thing that you need to have while you are building your business is a vision. How you would increase your company’s value and where do you see your company in the future? For investors to be interested in your business plan, it is essential to show them what you have in mind and how you plan to reach it. Along with business planning, you need a goal and vision that would help to keep you and the team on the right track. This is something that investors check before funding a business. Even though making a profit is the ultimate goal, achieving this needs proper planning by setting particular workable milestones that need to be mentioned in the business plan. Goals help to plan for the future. They give direction that would help make everyday business decisions in a much more accurate way. Goals motivate you to continue even if you suffer from setbacks. Both long-term and short-term goals are crucial towards the daily operations of the business. Short-term goals have monthly or quarterly milestones, while long-term goals are normally for longer periods of time, maybe 5 or even 10 years. But there is a trick for long-term goals. To make them successful, you need to add short-term milestones to it so that everyone can stay motivated towards fulfilling the end goal. That is why short-term goals are known as the stepping stone towards achieving a long-term goal. Have a measurable outcome for your goals, so that you can keep track of your progress. This will both help you plan your work, and also give you motivation once you achieve these outcomes. Also be sure to assign time frames to each one to make sure you are hitting them according to your schedule. Perform an honest evaluation by looking into your business idea and picturing the direction you want your business to move. Determine the challenges that you might have to work with and how you would work towards overcoming them step-by-step. Write down the goals in both the business plan as well as on boards or notepads so that you know that you need to achieve them according to a timeframe. You can also make a chart displaying your goals so that you can put it on the wall from where you can see it everyday. Examine the budget needed. You need to find out the amount that you might need for investment from the investors. With the proper plan, goals, and steps together, it becomes easier to get investments and achieve the goals to increase the company’s value. The right business goals would be able to benchmark your success, help you get the investment easily and would also work towards pushing you to succeed. This is one reason why goal setting should be an important part of your marketing strategy where you can celebrate each goal as you reach them. The moment you reach towards a goal, your company value increases. It is important to have a unique value proposition when you are pitching your business idea in front of the investors. Lets the ideal customer know why they need to purchase from you and not from another company (unique differentiation). It is important to not only present your value proposition in the business plan to investors, but to also share it on your company’s headers or website. What does the value proposition consist of? A headline sharing what is the main benefit you are offering. It should be an attention grabber. 2 or 3 sentence paragraph or a sub-headline with the details of what you offer, for whom and how is it useful. 3 bullet points listing the features of your service/product. Add an image or video as they attract customers better. Ensure that your value proposition is perfect and unique, as it is important to attract the customers to buy from you. This is the thing that would help you increase the company value and get you to the next level of investment to grow your company as well. There are also cases where the value proposition might be different for the company and the product. Hence, you need to address both of them separately and ensure that you add them in the business plan when pitching about your idea to investors. Most investors are unwilling to accept major setbacks or failures after having invested in your business. They ensure that the entrepreneurs are experienced and can perfectly manage the teams to provide the best performance and productivity. The entrepreneur should be the best in leadership and should have a right and successful history of past ventures. Nearly all investors do an in-depth background check on the person they are about to invest in. Hence, both business experience and industry experience is essential. Other than that, the commitment and passion should be visible so that it would inspire confidence in the stakeholders. Angel investors find it important that there is good chemistry between them and the entrepreneur so that they would be able to take a more hands-on approach in the companies that they invest in. It is obvious that investors need the company they invest in to grow where the company value increases as well. That is when they get the returns. So, if you want to help a bit to easily make the investor learn all about you in the first meeting, you can add all about your history and background in the business plan. This can be an additional part that you can add at the end of it. Also, give space to the investor to do their own research after they have had words with you. In many other places that you might have seen, you need to know the numbers properly. You need to prove to the investors that your company would have excellent financial performance along with all the other details. With this increase in the financial situation of a company, investors would get their return and the company value would increase. Most investors normally look for a company that would give them potential high returns immediately and has a clear exit opportunity. You need to be prepared to give answers to any question that comes across you regarding a financial plan or situation of your company. Borrowing money from investors isn’t just about keeping an updated cap table and getting the money. Create & Share Your Cap Table? Easily share your cap table and other company data with other founders, investors, shareholders, accountants, lawyers, and others. 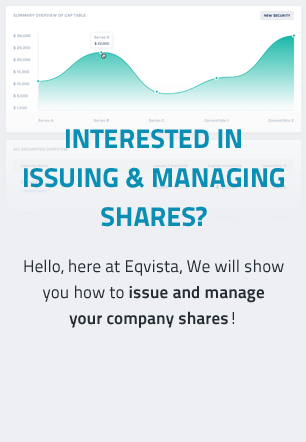 Try out our Eqvista App, it is free! You need to be worth the money you get and you need to have all the charts ready to show that you would put the investment to good use and increase the company’s value. But that is not all. You need to have your debt repayment plan ready as well. It is important to prove that your business has the capability to handle the financial obligations. If you are about to get funding from investors, ensure that you show the related financial documents of the business to prove the expenses (if any). Moreover, make sure you have proof of the number of shares that your company has or has sold out. For this, you would need your updated cap table ready with you. That is when the investors would evaluate the revenue streams, acquisition cost, and turnover rates. Almost all investors you meet would have a particular industry or investment type that they support. This means that they prefer to invest in a particular technology or particular vertical markets. Due to this, it is vital that you have the ability to articulate your forecasted market share, market growth, and market size clearly. This is vital as it would help provide credibility to your financial model and it would also help you analyze how you would increase your company’s value. You should also understand all about the investors before you contact them, so that you know that you are contacting the right investor who is also interested in the same industry. Moreover, choose the investor depending on the stage of your company so your business plan won’t be rejected. The valuation of a new business is normally based on the sales and if it has been in the industry for some time now, it is also based on how much it has grown and the revenue it is generating now. Even though it is said that you need to add the estimated valuation of your company after a while, do not expect investors to add the same amount of money that you want for making your company value grow. Keep a realistic valuation so that you do not get rejected by investors. For example, if your company had the sales of about $10,000 in the previous year, and while pitching to the investor you hope that your company value reaches $500,000 for the next year with the funding, it is important to realize that you would be rejected. This is because the value is very unrealistic. The moment your company starts generating profits, you would be able to see the strategic company value. While pitching to investors about your plan, ensure that you take your business model to them and prove that your company would become more profitable. Every type of investor has a different idea and looks for different attributes in a business plan. It is crucial to customize your business plan as per the type of investor you are meeting. To explain this point better, angel investors and the VCs normally emphasize a lot more on both the financial issues as well as the market issues. Hence, these areas have to be the main focus of your business plan when you approach these kinds of investors. The last and final point that you need to understand when obtaining funding from an investor for your company is that you should know what leverage you have in a negotiation. You also need to know the importance of negotiating an “optimum” valuation vs. a “fair” valuation. Each of the rounds for financing a private company is an intermediate step that moves towards an ultimate exit for your business, regardless of your choice to take your company public or sell the company. Therefore, it is highly critical for you to bring in the right investors and make a financial deal at a fair valuation as compared to getting the wrong investors that would not add company value at an optimum valuation. To explain in simpler words, you do not need an investor who is ready to give you $5 million as an investment that would be a bad match at the end of the day. Instead, it is better to accept the investment of $2 million from the investor who is right for your company. Other than that, it is also vital to consider the terms of the deal and the corporate governance as the main factors while you negotiate a financial deal for your company. If you are serious about being a leader, this is an important tip you need to follow. These tips are very important if you are working towards obtaining funding for your company to increase your company’s value. At the end of the day, it does not matter which business sector or industry you are in, how much funding you are looking for and where are you from; using the right method and creating the best business plan is important for getting funds and increasing your company value. The process for this would not be something easy, but if you spend time on each detail and ensure that all is right, the first investor you reach out to might just say yes to fund your company. Remember, in the end, you want to grow your company and increase the company value. So, do not tear out your hair looking for investors. As long as you follow these tips and your company is something that would offer the world with the best, investors would find their way to you as soon as you connect in a network of investors. Using these tips, you would be able to get the funding that is reasonable for your business to move ahead. But as soon as you get the funding and the company begins to take off, do not forget to update your cap table. It would be good to use the valuation services once in a while to check and keep a note of your company value. This would help you understand how your company is growing and how much you want it to grow in the next phase.